Lake Grove is an incorporated village located in Suffolk County, Long Island, New York. It is within the Town of Brookhaven. 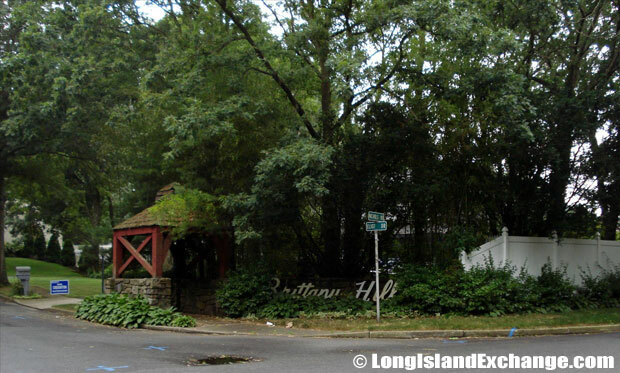 Lake Grove became one of Long Island’s oldest and busiest crossroad communities. The village has also become a commercial hub for a large part of Suffolk County. As of the 2010 census, there were 11,163 people, 3,722 households, and 2,948 families residing in the area. The median income for a household in the village was $95,385, and the median income for a family was $109,605. Males had a median income of $74,500 versus $45,333 for females. The latitude of Lake Grove is 40.852N. The longitude is -73.115W. It is in the Eastern Standard time zone. Elevation is 118 feet. 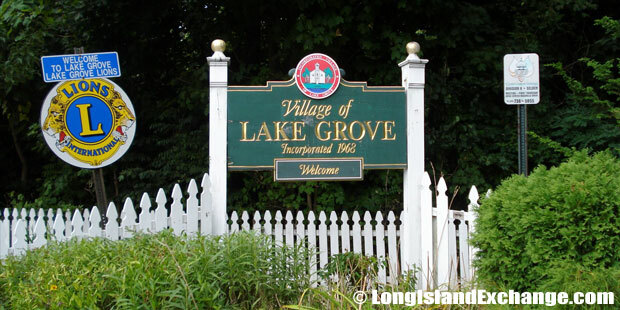 A sign on Elwood Road welcomes visitors and residents to the incorporated village of Lake Grove New York. In the early 1700s, the area was settled along Middle Country Road which was then part of the Old Kings Highway, originally a Native American track. 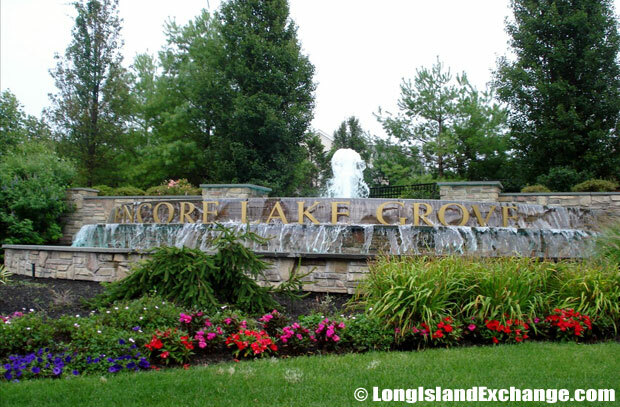 The former and merged names include Lake Ronkonkoma, Lakeland, Lakeville, and Ronkonkoma until it settled on the name Lake Grove in the mid-1800s. A single family home community called Brittany Hills. The area was named for the trees growing near Lake Ronkonkoma. In 1818, the First Congregational Church was constructed and has been preserved and is depicted on the village seal. DSW Shopping Plaza at Lake Grove. In later years, Lake Grove established its own post office which carried the mail to and from Lakeland Station by horse and wagon which was stopped in 1883. 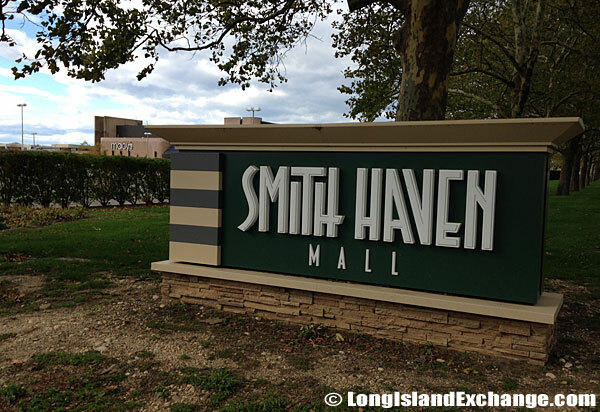 The opening of the Smith Haven Mall in March of 1969 had created a commercial boom, attracting new businesses, banks, and professional services to Lake Grove. The east entrance at Smith Haven Mall. Macy’s at the Smith Haven Mall, a major shopping mall located in Lake Grove. Well-known residents include Alycia Lane (television journalist) and Arthur H. Howell (Chairman of the American Society of Mammalogists). The racial-makeup comprises of White (89.9%), Black or African American (1.1%), Hispanic (2.0%) Chinese (2.6%), Asian (5.6%) and Two or more races (2.5%). 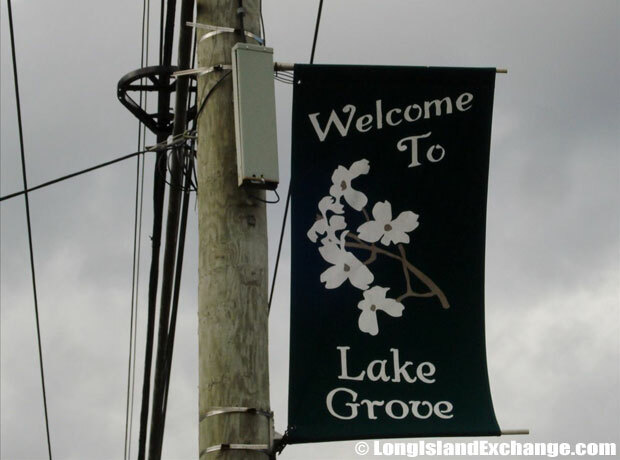 A banner welcomes visitors and residents to the incorporated village of Lake Grove New York. There are three school districts serving the Town of Lake Grove which are Sachem in the southern section, Middle County in the middle and northern sections, and Three Village in the northeastern section. Numerous recreational and educational programs are being sponsored throughout the year which help to promote a true sense of community for many of the residents. 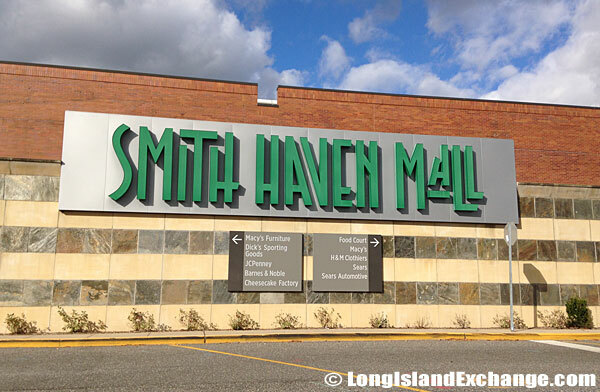 The south entrance at Smith Haven Mall. TGI Fridays Restaurant and Bar at the Smith Haven Mall, a major shopping mall located in Lake Grove. Several shopping malls, new parks, restaurants, businesses, and professional services can be found in Lake Grove. The Pomodorino is a local chain of Italian restaurants serving fresh ingredients and traditional cooking menu of appetizers, wood-oven pizza, and extensive variations of pasta. A brew house and Indian food are other highlights of the plentiful dining choices in town. Entry fountains at the luxury, resort-like retirement community Encore Lake Grove. Lake Grove also features a number of different style homes and affordable prices of housing. The median sales price for homes in Lake Grove NY in 2012 was $275,000. One bedroom Lake Grove apartments currently rent for $1,358 to $1,456 per month.